This month, we will be observing Holy Week earlier than last year. Do you have any plans already? Usually, our family just stays at home and participate the church activities to commemorate the death and resurrection of our savior Jesus Christ. In other times, we have a staycation, still within the city (because believe me, it's the most quiet and most traffic-free days in Metro Manila during this week) while everyone else is out of town for a family vacation. 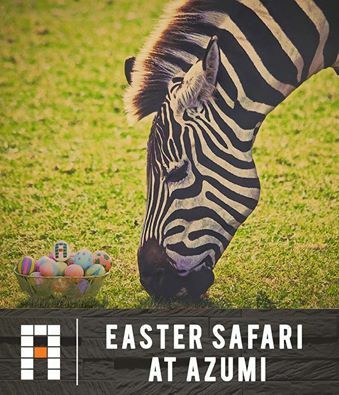 We rejoice and celebrate Jesus' resurrection on Easter Sunday by attending or participating an Easter egg hunting event/s in malls or hotels. 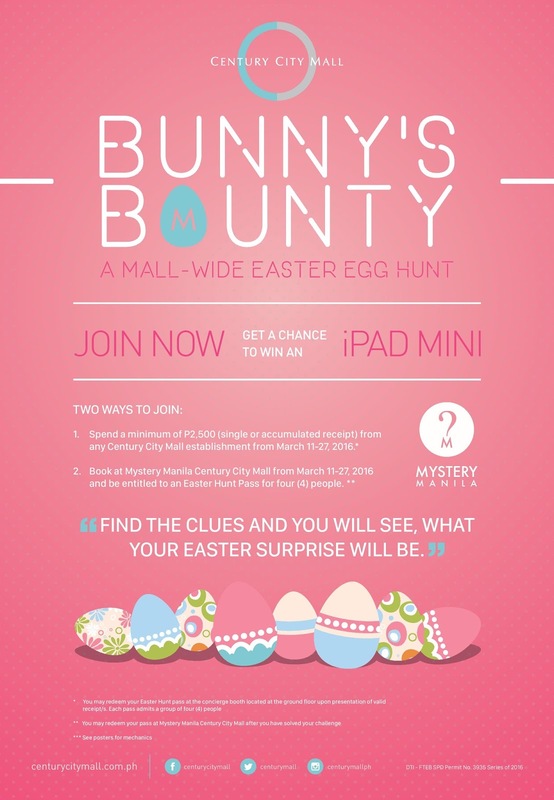 What: Spend a minimum of P2,500 (single or accumulated receipts) from any Century City Mall establishment from March 11-27, 2016 OR book at Mystery Manila Century City Mall from March 11-27, 2016 and be entitled to an Easter Hunt Pass for four (4) people plus a chance to win an iPad Mini . See website for promo conditions: www.centurycitymall.com.ph/deals or like them on Facebook for more. What: Open to kids 1- 12 years old. 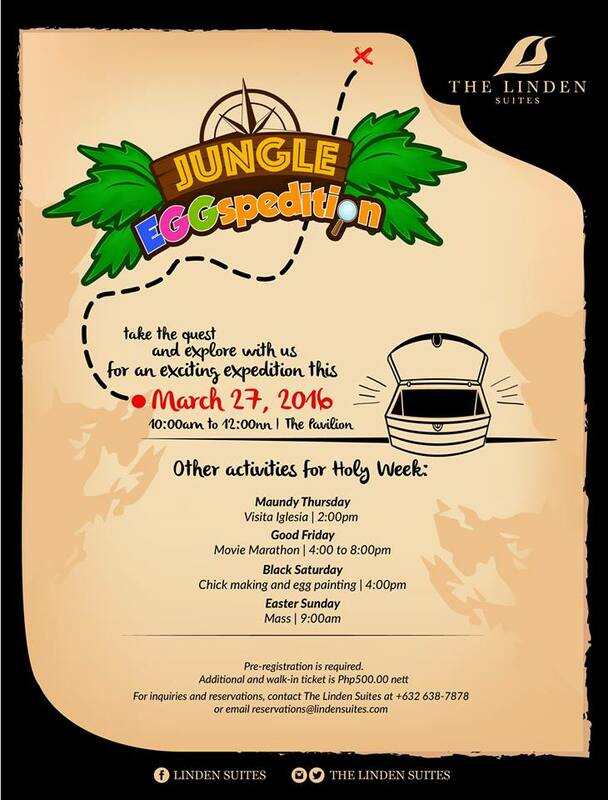 Activities include fun games, adventure, prizes and so much more! Fee: Php 550/child. Registration is on-going. Only first 250 participants will be accommodated. For more details call 370-2593 or like them on Facebook. 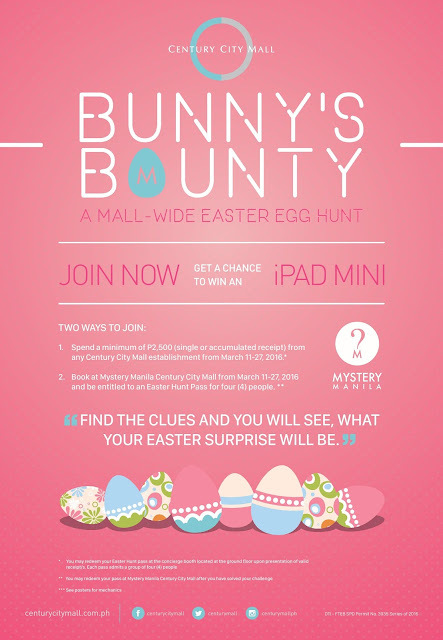 What: Eggciting Easter full of games, activities, and amazing prizes! 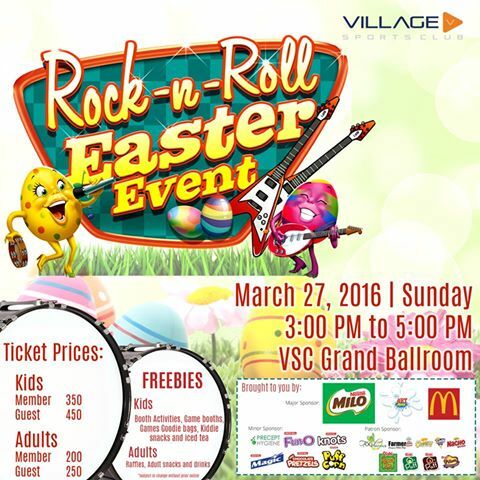 What: Activity booths, freebies and Easter loot bag. 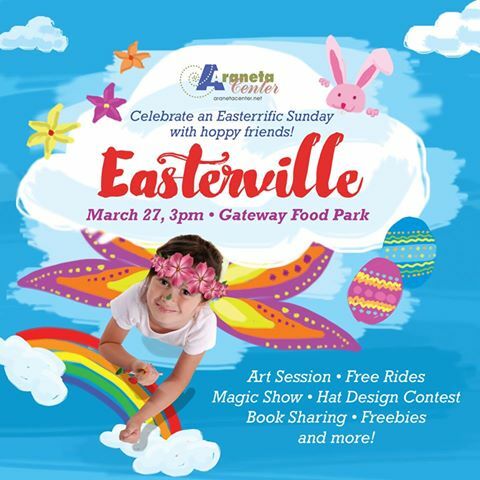 What: Freebies and kid-friendly activities, including arts and crafts, photo booth, sticker tattoo, balloon twisting, kiddie salon, face painting, and kiddie rides. Fee: FREE if: For every P500 single receipt purchase from any establishments in Araneta Center or two (2) cinema tickets from Gateway and Ali Mall Cineplex or P500 and above worth of ticket/s from Smart Araneta Coliseum, entitles a customer to FREE event pass. 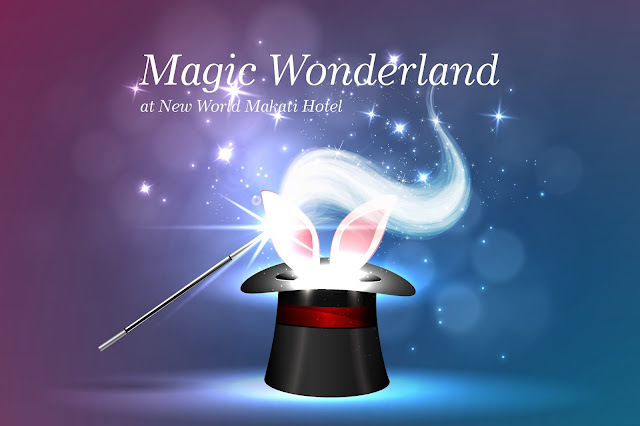 For Novotel guests, just present key card to get two (2) event passes. Official receipts dated March 27 should be presented. Registration starts from 11am to 3pm at the Gateway Food Park. For more details, like them on Facebook. What: The ticket comes with a booklet that gives you access to all the exciting activities and a loot bag. Buy a copy of the Superdudes book at the venue for a chance to meet and greet Stevie Nicholson and the cast of Superdudes. 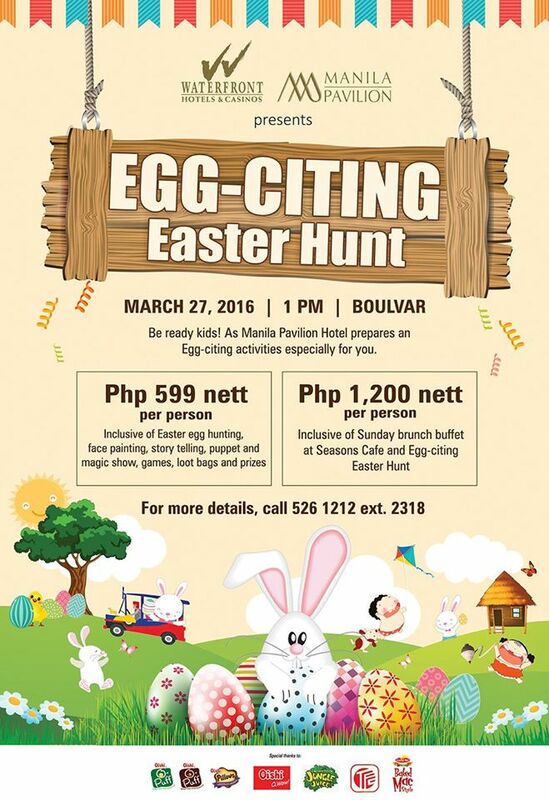 Fee: P599 (1 child and 1 adult companion). 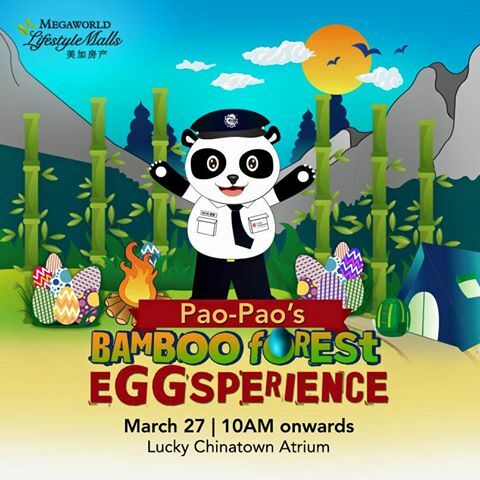 For more information, like Eastwood City on Facebook. What: For children 2-10 years of age. 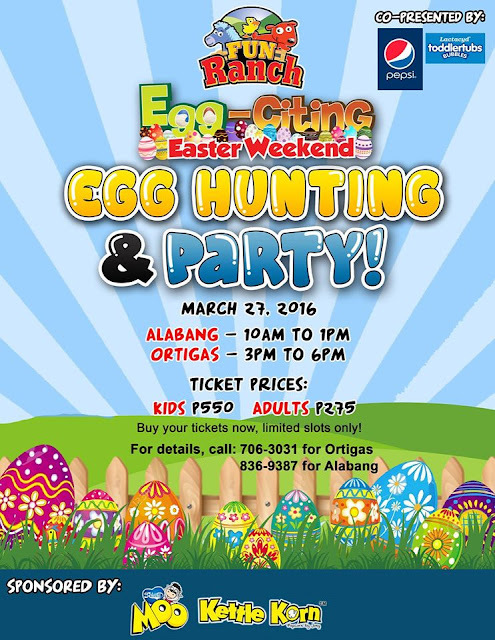 Activities and entertainment include: games, photo booth, kiddie salon and Magic Show. For more details like them on Facebook. What: Egg hunting, arts and crafts with FREE art set, mascot and magic shos, face painting, games and prizes, Free photo, raffle draw, kiddie snacks, and Easter Goody bag. 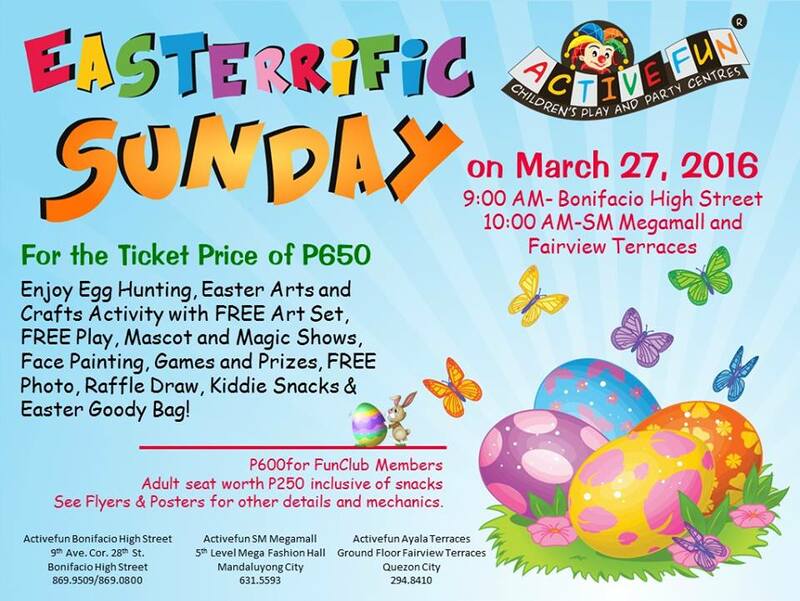 Fee: Php 650/child for FunClub members only. Php 250/adult companion. 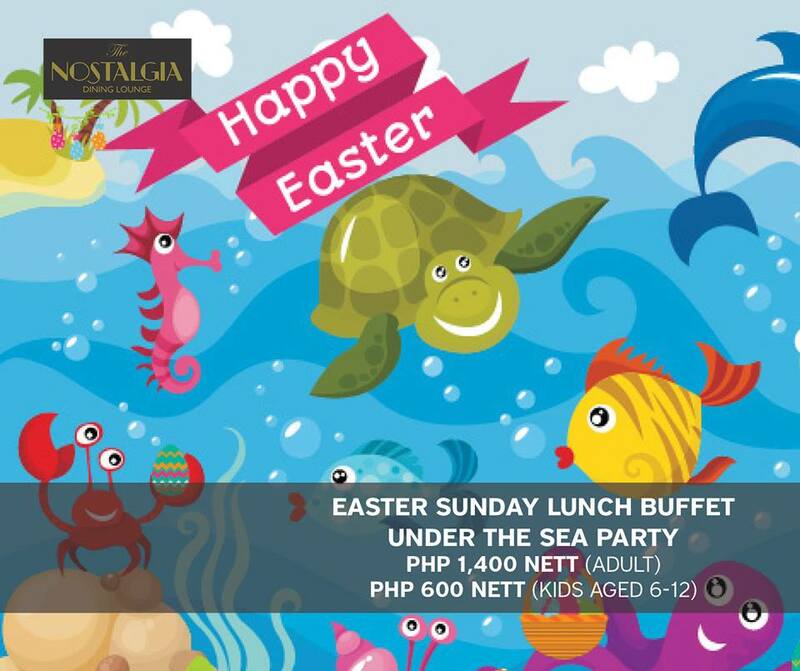 Fee: Php 1,999 nett/person for Easter Sunday brunch of Php 1,500 nett per person (if dining in as a Family 2 adults and 2 kids ages 12 and below) to get 2 complimentary tickets. Call (02) 990 7888 for inquiries or reservations or like them on Facebook. For bookings and inquiries please email fnb.reservations@thebelmonthotels.com or contact +63 02 318 8888 loc 1705. You may also like them on Facebook. What: Easter Egg Hunt activity. 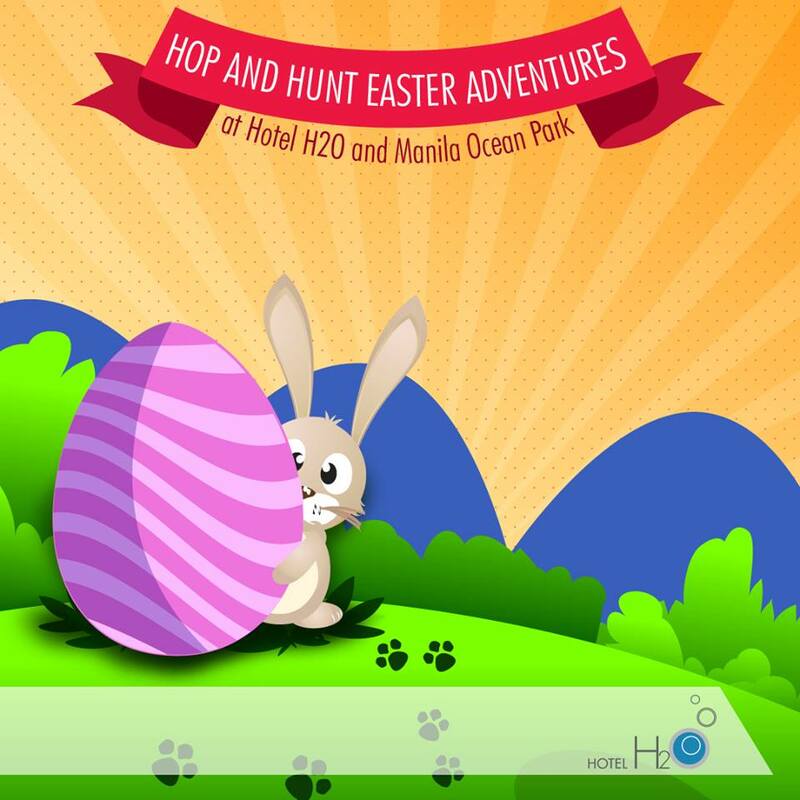 What: Lunch buffet, art activities, show and tell of Manila Ocean Park's creepy crawlies, face painting, film showing, mermaid show and of course the most awaited Easter egg hunt. 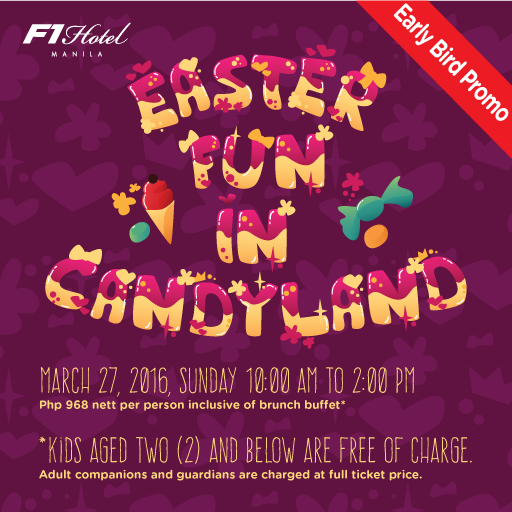 Fee: Php 1,099 for adults and Php 899 for kids. For inquiries, call +63 2 238 6100 or like them on Facebook. 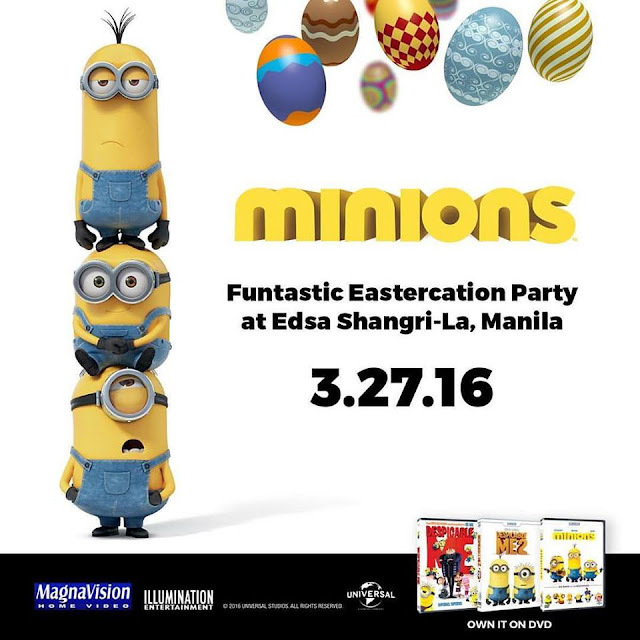 What: Games, game booth, goodie bags, kiddie snacks and drinks. 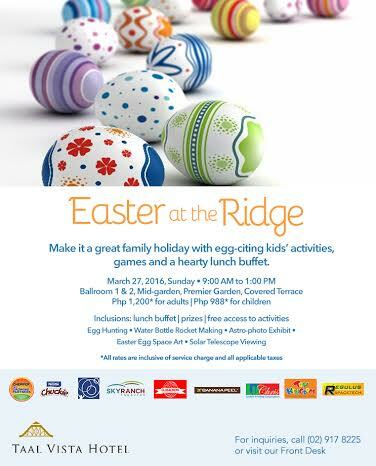 What: Easter lunch buffet with egg-citing games, fun-tastic activities and an easter egg hunt for the young ones! What: Magic Show, Brunch Buffet, Balloon Twisting , Photo Booth, Glitter Tattoo, Egg Decorating, Easter Egg Hunt, Loot Bag, other exciting games and activities. Fee: P968 nett/person (Early Bird Rate of P568 nett until March 10, 2016 only). Kids 2 years old and below are free while adult companions also pay full ticket price. For inquiries and ticket reservations, call (02) 928-9888. You may also LIKE them on Facebook for more updates. What: Face & Egg Painting, Cupcake Decorating, Photo Booth, Games, Glimmer Tattoo, Kids’ Salon, Musical Entertainment and Loot Bags. Kids in their candyland-inspired costume will get a chance to win exciting prizes. 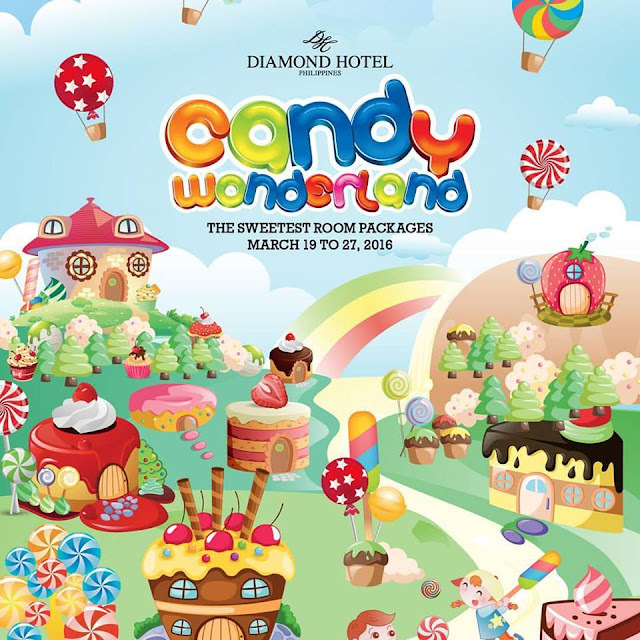 For more information, visit their website or LIKE Diamond Hotel on Facebook. When: March 27, 2016, Registration starts at 11:00 am. Event will run from 12 nn til 2:00 pm. What: Storytelling, Facepainting, Larong Pambata, prizes, and goodies for kids and parents. For more information, like them on Facebook or call 526-1212 local 2318. 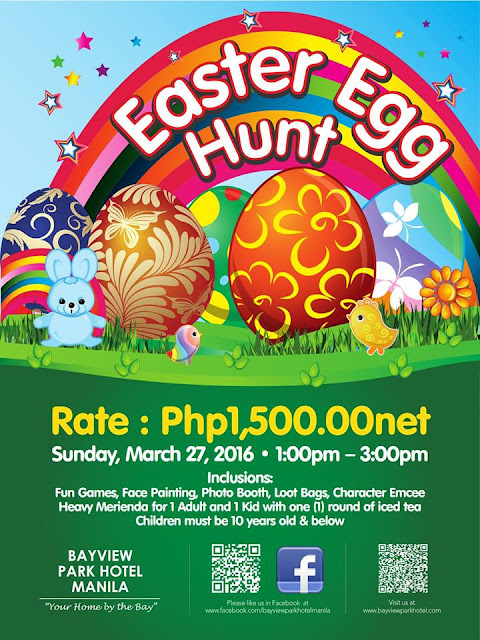 What: Snack buffet, entertainment, games, egg hunting activities and loot bag. For more details, contact them at 02-771-8181, visit their website or LIKE them on Facebook. 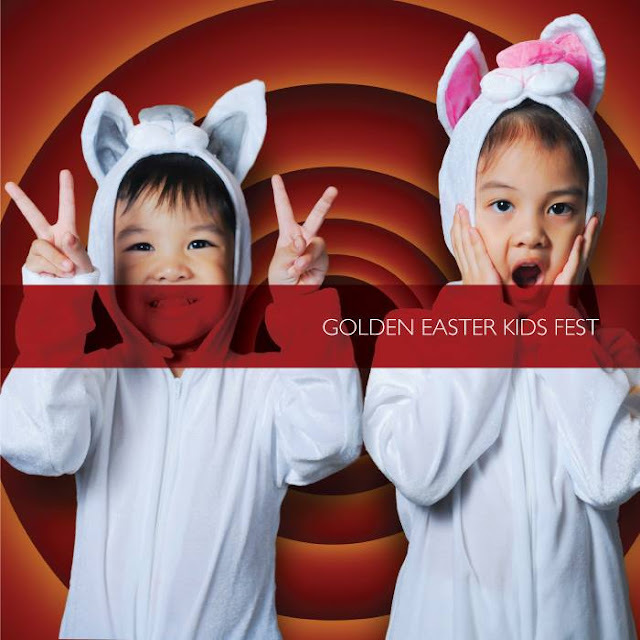 What: Fun games, face painting, loot bags, character emcee, photo booth, heavy snacks. Open to children 10 years old and below. 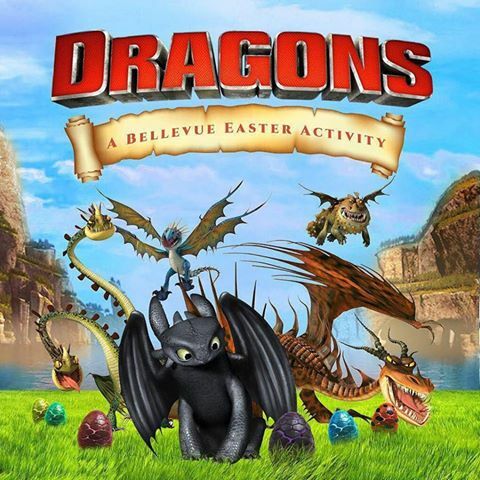 What: Fun and learning activities, games, prizes and surprises! Mad Science Show, Easter Egg Hunt, Games and Prizes, plus Snack Box and loot bags! For more details like them on FACEBOOK of call their Events team for tickets at 863 2222. 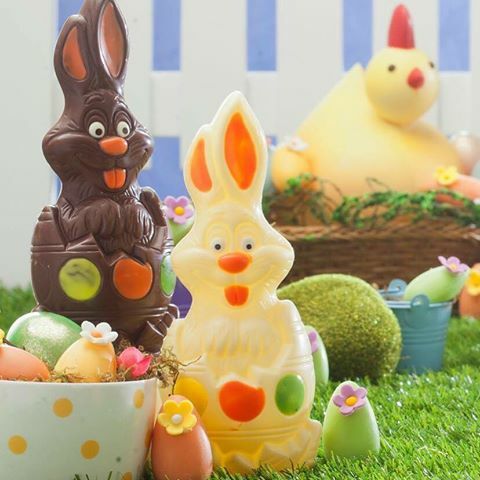 What: Snacks, classic confections and summer refreshments, various game booths and play areas with special prizes and giveaways, plus a live magic show and the egg hunt. 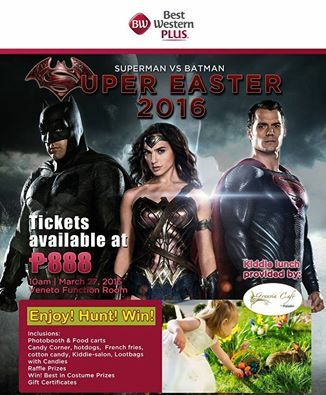 - Book a Superior room from the 20th to 27th of March at PHP6,200 and get two (2) complimentary tickets to our Easter activity at the ballroom! (Room rate is subject to taxes and service charge). 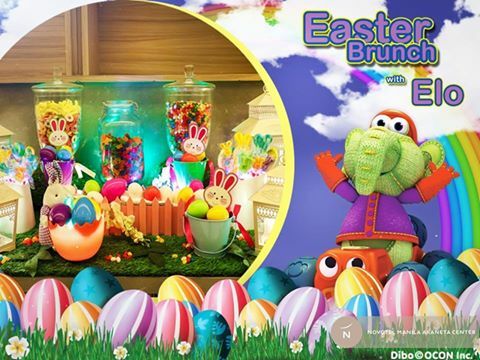 - Avail of Café 1228's scrumptious Easter Sunday brunch at PHP2,500 per person, and for every two (2) paying guests will receive one (1) complimentary ticket to our Easter Sunday activity at the ballroom! 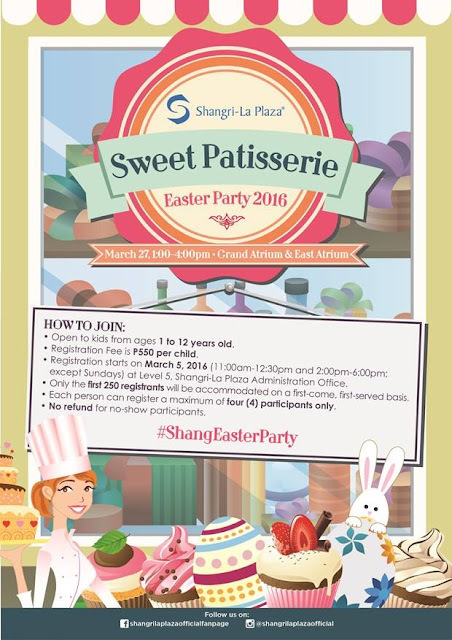 - Dine at Jasmine and enjoy the special Easter Sunday unlimited dim sum selections at PHP1,688 per person. 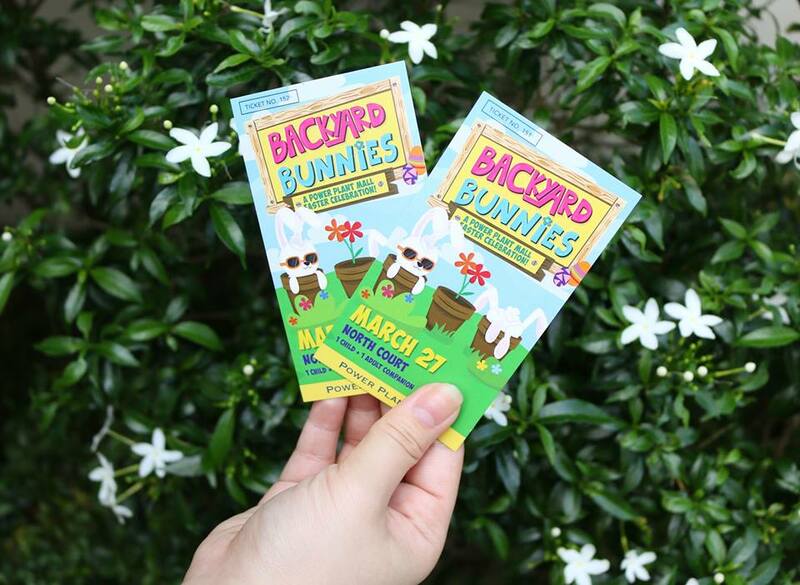 Guests with a minimum spend of PHP5,000 will receive one (1) ticket to our Easter Sunday activity at the ballroom! For more details, like them on Facebook or call them at +63 2 8116888 or visit newworldhotels.com/manila. What: Photo booth, food carts, kiddie salon, loot bags, raffle prizes, best in costume contest, egg hunting activity. For more information, like them on FACEBOOK or call them at 662-3300 / 773-3000 / 403-0808 / 403-0888 or email them at reservatiobs@antelhotel.com. What: Lunch Buffet, Easter egg hunting, Magic Show, and Goody bags. For more information, like them on Facebook or call 863-7777 local 623 (F&B Team). 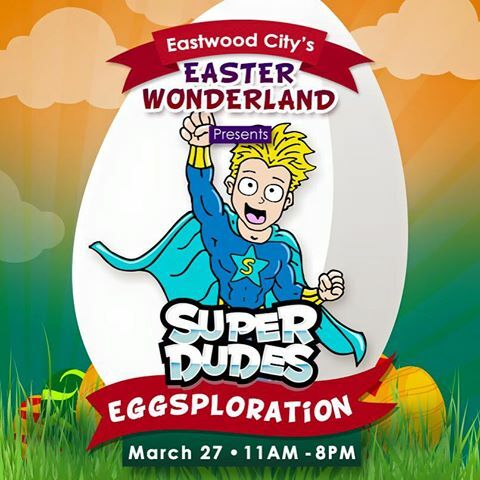 What: Mad Hatter’s Musical Show, Face Painting, Balloon Twisting, Giant Inflatables, Glitter Tattoo, Arts & Crafts, Games, Mad Hatter’s Café, and Egg Hunting Activity! 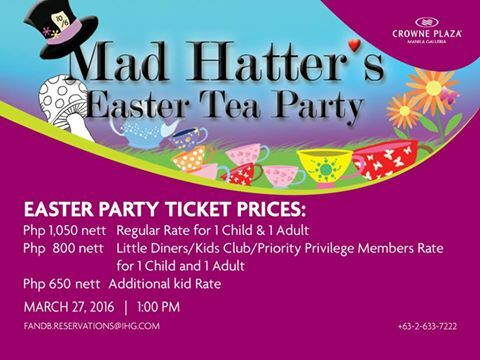 Fee: Php 1,050 nett for 1 child and 1 adult Php 650 nett for additional kid/ P800 nett for Late Diners/Kids Club/Priority Privilege members. 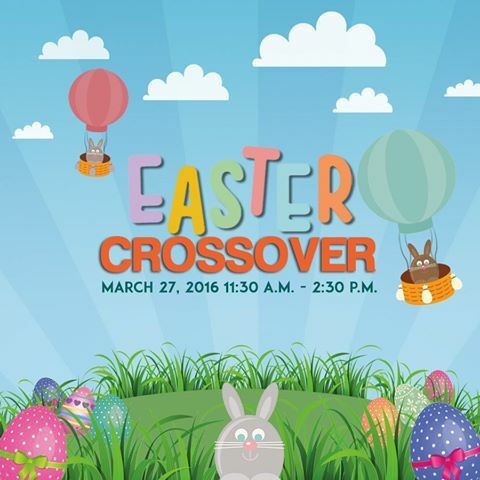 What: Magic Show, Face Painting, Balloon Twisting, Arts & Crafts, exciting Egg Hunt , prizes, and loot bags await kids joining the Easter Crossover. Maximum of 2 kids (14 years and below) free of charge when dining with their families. For inquiries and reservations, call Restaurant Reservations at 238 8888 or like them on Facebook. 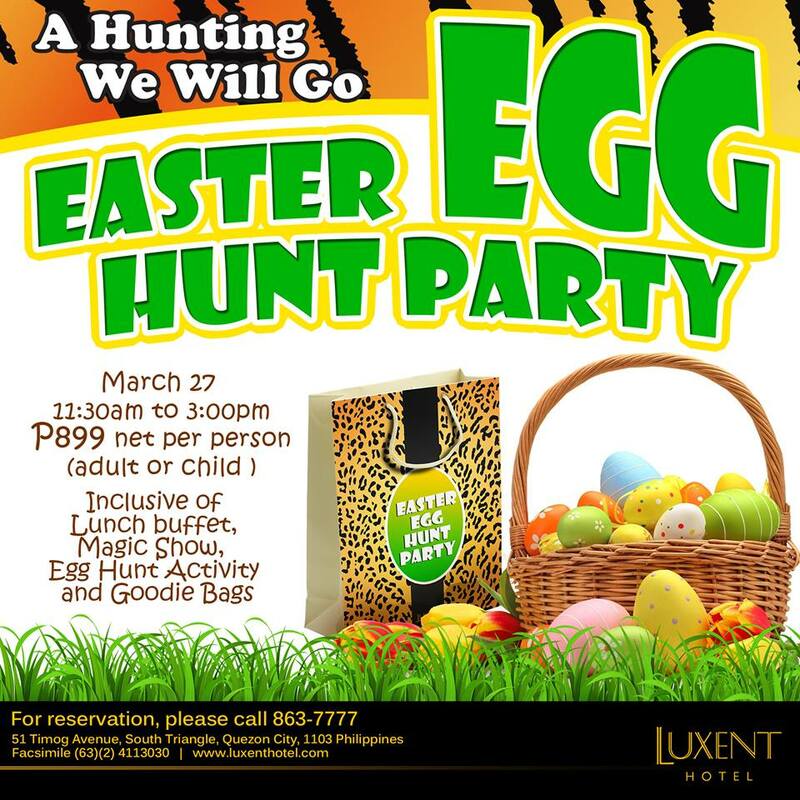 What: Brunch Buffet, Special Show, 1000 Easter Eggs to hunt, games and loot bags for kids. 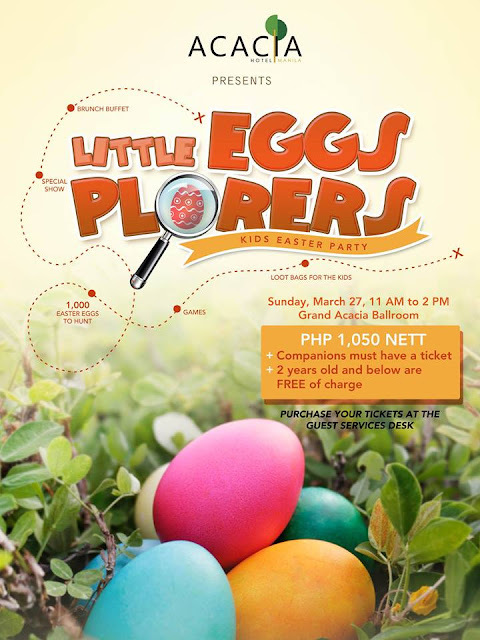 Fee: Php 1,050 nett per person (Free for kids 2 years old and below). For more info, like them on Facebook. What: Games, coloring contest, raffle, photo booth, food carts, face painting, bubble show, eggs painting, mascot dance, and magic show. Lots of giveaways from participating sponsors. Fee: Php800/person (with 20% buffet discount at the Cafe in the Park). For more details, like them on Facebook or call them at 528-5907. You may also email them at information@centurypark.com.ph. For more details, like them on Facebook or call them at (632) 633 8888. What: Egg painting, cupcake decorating, and a rabbit petting zoo. 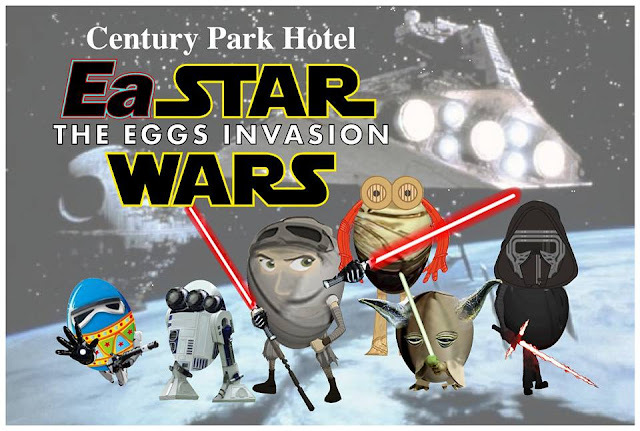 For more details, like them on Facebook or visit this link: bit.ly/GrandEasterHoliday. 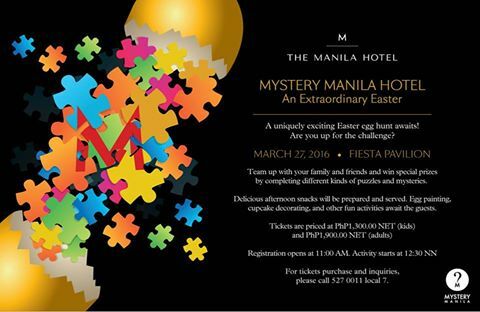 What: Manila Hotel and Mystery Manila partnered to give an Easter experience like no other. Special areas of the hotel will be laced with mysteries, puzzles, and mental and physical challenges. Open to all kids (7 years and above) and adults (13 years and above). You could play on your own or form your own groups (maximum of 6). 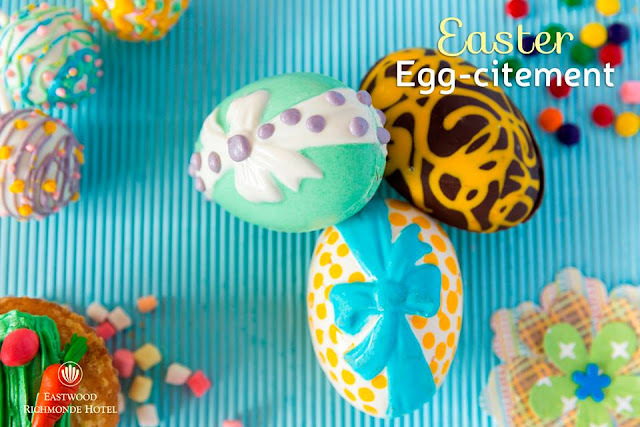 Other activities include: cupcake decorating, egg painting, and film viewing. Fee: Php 1,300 nett/kid and Php 1,900 nett/adult. For more details, like them on Facebook or call 5270011 local 7. Rate: PhP 750nett (adult or child) Children 2 years old are FREE of charge if accompanied by one paying adult. For more details, like them on Facebook or call (632) 570-7777. 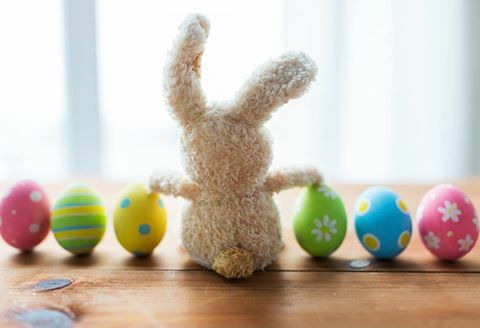 Wht: Activities include egg hunting, water bottle rocket making, Astro-photo exhibit, Easter egg space art, solar telescope viewing plus fun games and a hearty lunch buffet. There goes my first and second batch updated list of Easter activities loves. Please do come back for more because other hotels and malls are still beefing up their activities for the kids and the kids-at-heart as well.